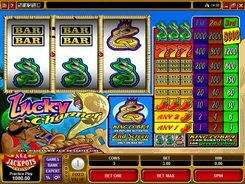 Lucky Charmer is a 3-reel slot machine played over a single payline. With its theme revolving around snake charming, the slot features classic bar symbols, chili peppers, sevens, green cobras and king cobras. Surprisingly enough for a 3-reel game, but Lucky Charmer has a bonus game activated by one King Cobra stopped on the payline. In this bonus game, you are to choose 1 of 3 flutes. The charmer then starts playing and reveals your prize. The slot comes with a coin value that is fixed at $1. Another adjustable betting option is the number of coins per spin (1, 2 or 3). When playing at max, you can win the slot’s highest award worth 5000 coins (or $15,000) if hitting three Green Cobras on the payline. To make it easier for you to create that combination, the King Cobra symbol can replace a missing green cobra to complete a win. Other icons cannot be substituted by King Cobra. To sum up, Lucky Charmer is a straightforward 3-reel slot with easy rules and a special bonus feature for more fun and entertainment. PLAY FOR REAL MONEY!